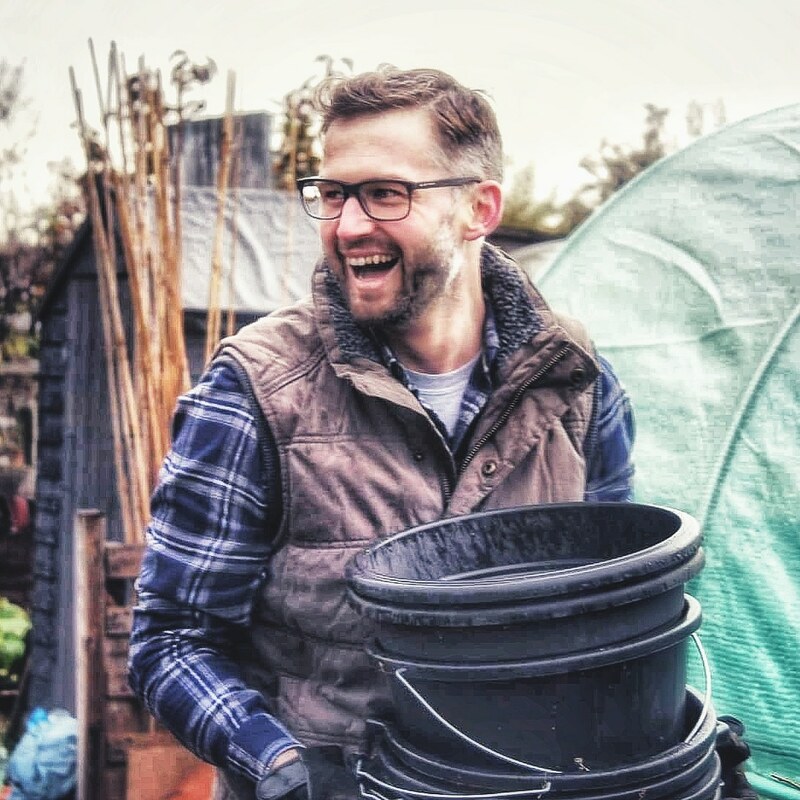 I’m hugely excited to publish this guest blog by one of my favourite garden bloggers, Andrew O’Brien. If knowledge is power, this article is a bazooka load of wisdom in the battle against allotment weeds. The modern day allotment holder is a hero waging war on many fronts, against bent councillors, greedy corporations, thieving bastards who’ll nick the tools from your shed or the pumpkins off your plot, and, not least, Mother Nature. While the first three may sadly be lost causes, the last, with a little understanding, may prove to be an ally. As a devotee of Growing Your Own, you’ll want to know your onions, but first, I’d argue, you need to know your weeds. Every person taking on a new allotment should be handed a small book detailing a few salient points to help them on their way. Had you been handed such a tome, you would have read of soils and worms, of compost, manure and mulches. But right at the start, before any of that, you’d have been invited to spend some time in contemplation of your five- or ten-rod plot, or maybe even the veg patch in your back garden – for what I’m about to say is just as relevant there – and consider the ambitions it has for itself. What you need to understand about land in the U.K., or anywhere that enjoys similar climatic conditions, is that, below a certain altitude, which we can call the ‘tree line’, it all possesses an innate desire to be woodland. Any patch of ground, if left long enough to its own devices, will revert back to the kind of broadleaved wooded environment that now only exists confined to small, distinct areas within our modern-day landscape. Before reaching this woodland stage, there are several phases (seres, or seral communities) – each with its own distinct pattern of vegetation and accompanying fauna – through which our nominal plot of land will transition before achieving what ecologists call its climax community. First, there’s bare rock, and later a stage in which a layer of soil has developed – a phase which might also be returned to from later stages after ground clearance caused through fire, or an excavation for example. The characteristic vegetation of the next stage is scrub, where the pioneers of the plant kingdom move in, with all their clever adaptations for surviving inhospitable environments honed over millennia. The developmental steps between this phase and woodland need not concern us as gardeners and plot holders, because the point just before this scrubby phase is the stage at which we, and every agriculturalist on the planet, battles to hold the land in its inexorable journey back to the climax vegetation of their region. It’s why, if you’ve been forced to take time off from your plot or garden, through pressures of family or work or illness, you return to it with a sinking feeling that a powerful, unstoppable green tide has rolled over the place and your plot’s gone native. Because, in short, it has. Cnut-like we stand in the face of the oncoming breakers, one hand outstretched, palm out, the other, knuckles whitening, clutching a hoe with desperate resolve. It’s easy to become despondent about the task of keeping the weeds from your plot, but there are tried and tested strategies to help you get on top of things. There’s the joy of mulching, the relatively weed-free results achieved by Charles Dowding with his No-Dig method, and I’ve written here about the trick of gaining some traction with a ‘little and often’ approach which can really help when you’re feeling overwhelmed by your garden or plot. But, while I’ve been known to wax lyrical about the wonder of weeds, and what they can teach us about ourselves and our gardens, when it comes to growing food for your table, they’re right up there vying with slugs and snails for the title of public enemy number one. Being able to identify the common weeds on your plot, knowing how they grow, and having strategies to deal with them, will make the whole experience of growing your own more successful, and consequently, more rewarding. Let’s take a look at the top five offenders. Couch grass (Elymus repens) looks fairly benign, but it can get a bit out of hand if left to its own devices. One of the most intimidating things about taking on a new allotment space, or returning after a period of absence, is that a neglected plot can become so over-run with couch grass (Elymus repens) that it resembles not so much a system of vegetable beds but rather some kind of shambolic and lumpy lawn. Couch can spread at an alarming rate and can cause a problem when it becomes entangled in the root systems of perennial plants, but on the allotment more often than not it’s just a question of putting in the time to hand pull the stuff in order to keep on top of it. Once a major infestation has been dealt with, it’s a matter of keeping a wary eye out for bits of left over root sprouting mini colonies, and forking these out. You will of course need to watch for it making a land grab for any areas where you keep perennial fruit, such as raspberries and currant bushes. There’s a kind of rhythm when weeding couch grass, and it’s not an unpleasant activity. Every so often, there’s a dense clump which, on inspection, is anchored quite firmly into the top few inches of soil by sturdy white roots. Between these anchor clumps, the thin underground stems, or rhizomes, radiate over considerable distances, producing shoots and roots at each node. These roots tend to have a less tenacious grip on the soil, so several feet of rhizome can often be pulled up with only a light forking over, with a little more welly being required for the parent clumps. Couch grass rhizome with shoots at each node, and a (reasonably modest) ‘anchor clump’ at far right. Likely as not it will be in any grassed areas around the site, from where it will continually try to wander back onto your plot. In common with all of the plants here, it’s not a good idea to put couch grass straight on your usual compost heap, where it will continue to grow. A HotBin might be ok, but to be on the safe side, the weeds should be either put in a plastic bag, or similarly drowned in a bucket of (smelly) water to rot down before composting. In my experience, people tend to come over all unnecessary about Ground elder (Aeogopodium podograria). True enough, this relative of the humble carrot – readily recognised by its compound leaf and flat, white umbels of flowers, both features leading to its common name – can quickly establish sizeable colonies, and it can be a pain when the mass of tangled roots inveigle themselves between bulbs and perennials in the ornamental garden. But it’s not unattractive, its leaves are edible, so there’s no worry about contamination should a bit get into your rhubarb (which is arguably more poisonous but better behaved) and, with patience, isn’t too hard to get rid of, though it will take a few seasons. I’ve had success continually strimming the top growth off to weaken the plant by starving it of the ability to photosynthesise, and hoeing would work just as well. But if you can get to it, as you should be able on your plot in the rotation beds, it’s a matter of removing as much as possible of the tangled white network of roots, and being prepared to do this for a few years. The leaves can go into the compost, but the roots should be bound for the bonfire, or the rotting pile. However, don’t sweat it with this one, you will get it under control and, until then, the two of you can coexist in a reasonably peaceful arrangement. The Common, or stinging nettle (Urtica dioeca) loves the rich soil of the plot, and will happily move in to make the most of the high nitrogen and phosphate levels, spreading by means of their bright yellow, creeping underground rhizomes and also stolons which spread on the surface of the ground. The common stinging nettle (Urtica dioeca), with characteristic yellow roots and purple stolons. Of course, they are painful to deal with to all but the hardiest of gardeners, but once the top grown has been dealt with (an excellent addition not only to the compost heap, but also the kitchen), it’s best to fork out the sturdy root system thoroughly, as any fragments left behind will result in new plants. Not a hard weed to get rid of, but I confess to allowing a few to loiter by the compost bins, mainly for the butterflies, whose presence in the garden more than makes up for the occasional sting. There are two kinds of bindweed commonly afflicting the allotment holder, hedge bindweed (Calystegia sepium) and field bindweed (Convolvulus arvensis). Hedge bindweed is the more robust looking of the two, with an admittedly rather pretty white flower that adorns the vines in summer. In order to present that flower to the sun and to pollinating insects, it will ruthlessly have rampaged over everything in its wake, hoisting itself ever upward, bending, breaking and strangling in its progress. It is, frankly, a complete git. Its more delicate, pink flowered companion, is less vertically inclined, but can scramble across an alarming amount of ground in one season, robbing the plot of nutrients and smothering seedlings and low growing crops. Field bindweed also produces seed in abundance, and although hedge bindweed relies more on vegetative growth, the seed of both plants remains viable in the soil for many years. Bindweed’s thick white rhizomes typically lie at about a spit’s deep in the soil (the depth of a spade) and, being rather brittle, are prone to break into smaller fragments, each of which has the capacity to turn into a new plant. But, as the entire root system of bindweed can extend 5 metres into the soil, there’s little chance of digging it out. Persistence and vigilance are key with these weeds – repeated removal of the upper portions of the plant will weaken it to the extent where it becomes manageable. But ignoring the appearance of new leaves and stems in spring only stores up trouble, as the first warm and sunny spell will result in a prodigious entangling of your precious veg. The weed whose arrival plot holders fear perhaps above all others is also the one with the most exotic, other-worldly appearance. But the horsetails have been on the planet for millions of years, and as the only surviving member of the class Equisetopsida, the Field horsetail (Equisetum arvense) can be considered a ‘living fossil’. All of which is very interesting, but unless you’ve been nursing an ambition to go paleontologically retro on the allotment, you probably want it off your plot. Damp conditions and a low pH suit this weed best, so if you have a soggy, slightly acidic soil, you may well be a prime location. In spring the brown fertile stems appear topped with spore-baring sporangia, bearing, according to some, a marked resemblance to ‘stove pipes’, and being, according to more observant and less innocently-minded folk, dead ringers for…something else. Let’s say truncheons. These are succeeded by the green, photosynthetic stems with the characteristic dark brown band marking each of the many short joints, at which point a whorl of needle-like leaves originate so that the whole things resembles nothing more than a bright green bottle brush (in fact, being rather high in silica, they have often been used as scrubbing brushes). But, in spite of the impressive number of spores released by each sporangium (hundreds of thousands), it’s the fast-growing rhizomes that are accountable for the greater part of the efficient colonisation. That said, the spore bearing stems need to be hoed off before they have a chance to reach maturity, and indeed the green shoots should similarly be removed to prevent the sugars created up in the leaves begin transferred to the root system and stored over winter. Excluding light from the plant (by covering in black plastic, or carpet) doesn’t work – this primordial throwback can bide its time, and the most effective organic way of dealing with it is by patient removal of aerial parts and as much of the rhizome as possible in order to weaken it (the roots can penetrate 2 metres into the soil, so complete removal is not an option). Keep at it, it’s a war of attrition. You’ll get to know each other well over the years. Plastic. For particularly badly weed-infested areas of your plot, it’s worth covering the whole area in black plastic for an entire season. This has the dual benefit of creating a physical barrier to stop the weeds growing, whilst excluding light and rainwater to prevent the roots from adding to their stock of energy-storing starches – the combined effect being to exhaust the plants of energy. Of our top five perennial weeds, this method is likely to work to control the couch grass, and possibly the nettles and ground elder. On the plus side, in the second year, you can make slits in the plastic and plant through it (a pernicious bindweed with a store of energy will find its way even out of this hole in the first season under cover). The downside – and it’s a not inconsiderable one – is that the warm, humid microclimate created under the sheet is loved by slugs. And, to an extent, rats. Hoe. There’s an old allotmenter’s adage when tackling a persistent weed – “never let it see a Sunday”, a call to getting rid of the top growth on a weekly basis. The hoe is your friend, and key ally in managing your plot and maintaining decent yields for your table. Try to use the hoe as a preventative measure, rather than a cure for weeds that have been allowed to become a problem. If there’s a downside of hoeing (apart from needing good control when steering between crops), it’s that the regular disturbance of the soil gives annual weed seeds a chance to reach the light and germinate – but that’s only a problem when you get behind with your weeding. Apart from which, once you feel you’re getting to a stage where the perennial weed growth is slowing, if not abating entirely, you can employ the next weapon in your armoury. Mulch. Do this generously, using well-rotted organic material in thick layers of, at the very least, two inches, preferably double that. If you’re mulching paths and non growing areas, you can use fresh woodchip, but this should be kept away from growing plants (apart from weeds) as the process of the rotting down ‘locks up’ the nitrogen in the soil and deprives your veg of that essential nutrient. Chemical weedkiller. Just…no. Especially around edibles, but also consider the effects on pollinators. Weed suppressing membrane. I wouldn’t. The cheap ones are worse than useless, the expensive ones work for a few years then break down and become more of a problem than a solution. The main issue is that, while a good membrane will prevent weeds growing up through it, there’s nothing to stop organic material gathering on top of it, which rots down and provides an ideal growing medium for weeds. As the membrane begins to break down, the weeds root through it, making the eventual removal of the now useless expanse of material a complete pain in the nethers. Mexican marigolds. Tagetes minuta, is a plant which releases a chemical at the roots which many have found to be effective in controlling perennial weeds such as ground elder and bindweed. The process is known as alleopathy, and it should be remembered that the inhibiting function is as likely to work on your veg as the weeds you want to target, so this is a method for clearing a patch over a season, rather than a companion plant in the manner of more familiar members of the marigold clan. The mexican marigold itself can become a something of an annual pest, so best to cut it back before the flowers go to seed. Grow potatoes. Who hasn’t come across tangled clusters of brittle white bindweed roots whilst harvesting their spuds? There’s more furtling about in extracting a potato from the soil than with most veg, and the process offers an ideal opportunity to simultaneously extract a good portion of the subterranean network of a problem weed. Andrew O’Brien’s blog is Gardens, weeds & words. You can also follow him on Facebook, Twitter and Instagram. It is sometimes said that weeds are created by weeding. So far the allotment committee are proving hard to convince on this matter. There’s no denying, he is! I do yearly battle with bindweed in my garden. Constant vigilance is the only solution. Dug a great nexus of white roots out of my front garden last weekend – a full trugs worth. I hate it with a passion. Grrr. Yes, bindweed is a complete git: I agree wholeheartedly! Thanks for the helpful weeding tips. I dig up nettles and turn them into soup to feed my family. Weed and feed…Lol! You have convinced me to look a little more kindly upon my very fine display of Ground Elder! I have always regarded it as a real garden villain, but your view is much more relaxed ! This is fantastic. If ‘bookmarking’ didn’t exist then I would probably print this out! Weed names are great aren’t they: ‘ Ground Elder ‘, ‘Enchanters Nightshade’ , ‘Horsetail’ – like something straight out of ‘Herbology’ in the Harry Potter books. Cheers to you both! If this were Weed Bingo I’d be bopping up and down, waving my card & shouting…My horsetail has never developed the spore heads, yet. Though I am spotting lots of tiger-striped roots in the beds at the moment, so it’s definitely on the move again. I have to say you missed one – those horrible buttercups with black taproots which also spread by runners. They are endemic on our site, and if you snap even a fraction of the root off it comes back so a bed can be engulfed in very little time. Hate it, hate it, hate it. When I first got an allotment I was told all about the ‘unholy trinity’ of couch grass, bindweed and horsetail. I think because that Oxford allotment site was full of them. Like Andrew says, the mainly way to keep them under control is regular hoeing. I think bindweed is the one I hate the most. In my experience, No-dig works wonders with annual weeds, but these perennials are are bit more bloody-minded. This is a really great post and should be put into a leaflet and given to each new allotment holder.